Estate Planning First Steps: How Much Is Your Estate Worth? 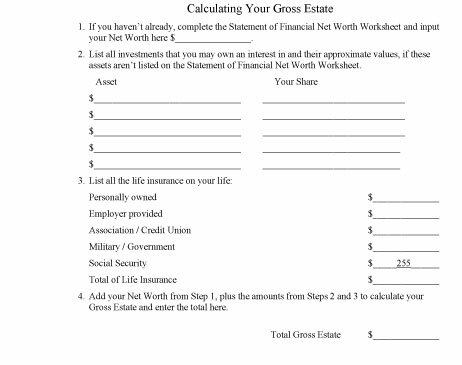 Click here to download and print the Calculating Your Gross Estate worksheet. If you haven’t yet determined your net worth, the Statement of Financial Net Worth Worksheet can help you figure it out. 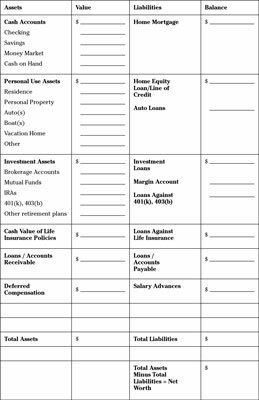 Click here to download and print the Statement of Financial Net Worth worksheet. The number you came up with for your gross estate is probably bigger than you were expecting. That number represents, for most people, the stuff you need to figure out what to do with, and your estate plan tells the world what you want to happen to your stuff when you die.